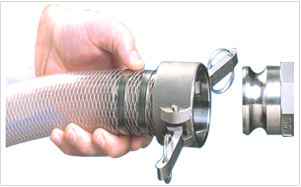 Camlock Coupling Manufacturers In India | BS HYDRO-PNEUMATIC PVT.LTD. B.S.Hydro manufactures camlock coupling with wide variety of material, end connection and sizes. Camlock coupling is designed for leakproof full flow of fluids. Camlock couplings offers positive leak proof connection without use of any tools. It can handle many vairiety of fluids, semi solids, paste, powder for bulk material transfers. Frequequent connection and disconnection of these fluid lines is done in seconds with camlock design. It minimizes material loss and down time. know more..
Camlock works on a lever lock principal. The coupler levers are opened and the adaptor is pushed in to the coupler. The adaptor is then securely locked by closing the lever. This action simultaneously compresses the seal in the coupler and provides a leak proof joint. Disconnection is done by opening the levers and pulling the adaptor out of coupler. Bulk material transfer of: Oil, water, paste, powder, solvents, semi solids, slurry and abrasive materials.